Because I work at a company that makes water activity meters, I have overly sensitive antennae for mold problems that can be solved with water activity. 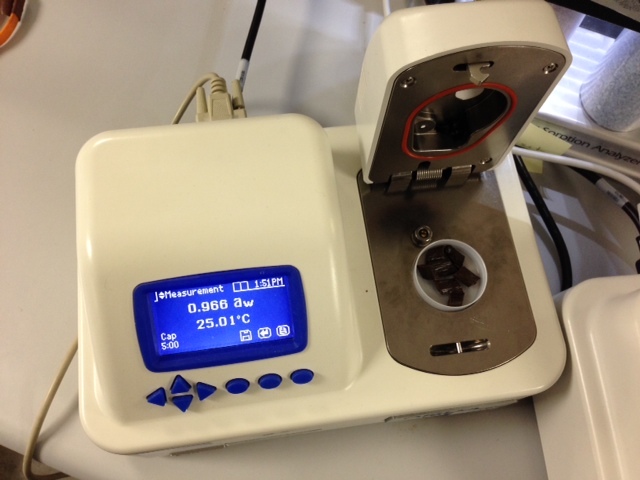 The concept is pretty simple: if a product’s water activity is below 0.7 aw units, it’s probably not going to mold. If it’s below 0.6 aw units, it definitely won’t mold, no matter what. I recently ran out of a supply of vanilla beans I bought at Costco a really long time ago. Since Costco doesn’t stock them anymore, I tried amazon.com, a somewhat useful source for obscure or exotic shelf-stable ingredients. I happened on a 4 oz. 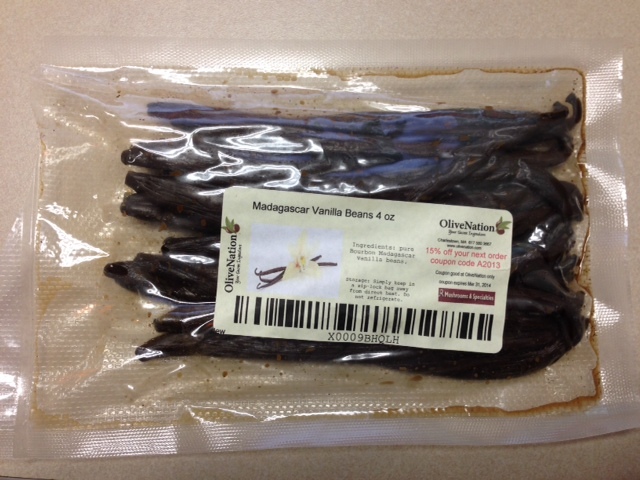 bag of Madagascar vanilla beans with a relatively high rating. For a bag that might contain 20 or so beans, $20 seemed a good deal. Then I noticed that a number of recent reviewers complained that after using the first bean, the remainder promptly turned into a mold farm. Ahh -food and mold. Sounds like a water activity problem. So there are a few interesting things here. 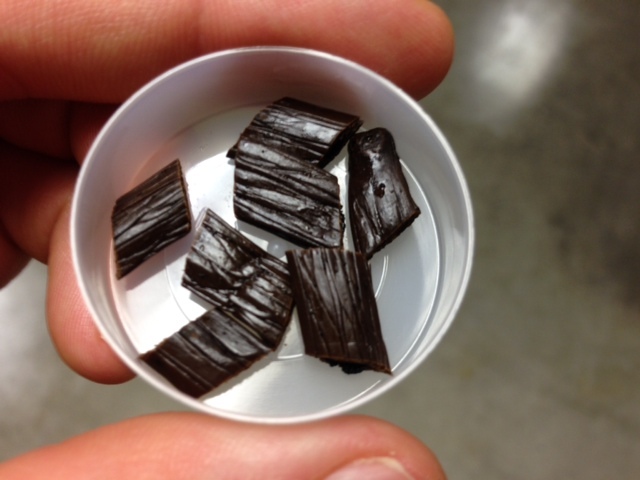 First, the beans themselves are described as “pure bourbon Madagascar vanilla beans”. They appear wet in the package, and you can easily see that there’s some kind of liquid in the package along with the beans. Alcohol does have anti-microbial properties, but I suspect a water activity of 0.966 is just too high. Even if the liquid is bourbon, it still has more water than alcohol. Note that the unopened beans won’t mold because there’s no oxygen in the bag. Once opened, not only will mold spores be introduced, but oxygen, too. If I were to put these in a zip-lock bag on the shelf (as advised by the package) there would almost certainly be a mold problem. Not sure if the manufacturer ships them this way because it is fixated on selling a certain weight of product, and sending out a “dry” bean would mean that for 4 oz. of beans, you’d need to add more beans. I’m more interested in how many actual beans I get for the money, since that’s how they’re used in recipes: one at a time. How should we solve the problem of the mold menace? By doing the exact opposite of the directions on the package. I’m going to leave the beans on a wire rack overnight, and see how much water evaporates off. Incidentally, this is the same strategy used in the Zombie Cheeseburger post. The easiest way to make sure something doesn’t mold is to leave it on the counter and let it dry out. Once I’ve reached a water activity of 0.7, then I’ll put them in a zip-lock bag and use slowly over the course of many months. Oh- and I’ll post here on how that strategy works out. i work in a vanilla industry and i find your tests conclusive. Have you conducted any other tests on vanilla? We haven’t conducted other tests on vanilla at this point. The original premise holds true, though, and industry QA people should be aware that cured vanilla beans will grow mold if the water activity is above 0.7 water activity units. Thanks for reading, and please let me know if you have any other questions.